Hi! I’m Lauren Browning. I recently joined QAI as a Business Development Manager and couldn’t be more thrilled. It has always been a goal of mine to give back and contribute to something bigger. With QAI’s core values of being passionate about food, people, animals and the planet, I truly feel that I have found my place. My experience coincides perfectly with my new role and I am very fortunate to be working with such an experienced, diverse and friendly team doing what I love. I grew up in a quaint village in Northern Michigan with a population of only 500 people and wouldn’t have it any other way. I graduated from Michigan State University, with a bachelor’s in communication and shortly afterwards was drawn to sunny San Diego. 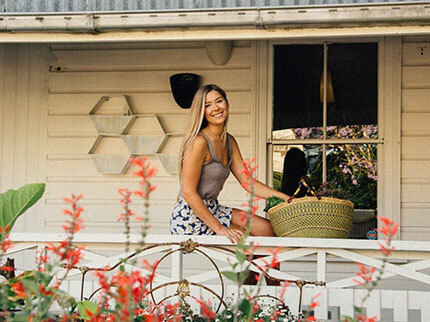 After spending several years in Southern California, I made a leap of faith and moved to Australia where I was first exposed to working in the organic food industry. I began doing sales for a start-up health food company that made sauerkraut and kefir. Although extremely excited about the job and eager to learn, on my first day I thought “What the heck is kefir? !” Being instantly exposed to probiotics, adaptogens and superfoods and the like, I saw this as a great opportunity to learn something new, but what I didn’t know was that this would pave the way for my future and how I now view food. I was so inspired that shortly after I began my sales position, I started my own organic food business and sold to markets around the local region. Alongside running my business, I moved into brand management for our sister company which was an organic food distributor. I loved this role because I got to meet with brand owners daily and discuss their passions, challenges and how we were going to overcome them and take on the world. In addition to this, I worked with a local company that we were distributing throughout Australia to develop a new brand image and voice that would speak to their target market. You could say I was busy, but the best part is that it never felt like work. On a more personal level, a few things in life that I value the most are my family, yoga, clean water and traveling – Indonesia being my favorite place to date. I’ve always gravitated towards the water; whether a freshwater lake or the ocean, my soul feels complete when I look to the horizon and it meets a body of water. When I’m not at work you can find me exploring the many markets of San Diego, attempting to make raw vegan desserts (even though I’m not vegan) and sipping on fermented fruit cocktail (aka wine, organic of course!). I value developing genuine relationships and knowing that tomorrow is never promised. I think it’s important to laugh at least once a day, appreciate the ones you love and try not to take life too seriously! Although coming from opposite ends of the spectrum, my parents both have a medical background and have always had a holistic approach on medicine (my mom being a nurse and my dad a chiropractor). I also believe that food can and should be used as medicine and, for me, maintaining a healthy lifestyle is all about balance. My two older brothers are my best friends and have always made sure to keep me in line and for that, I love them.